I've discussed "Hearthstone" and how fun it is in previous writings. 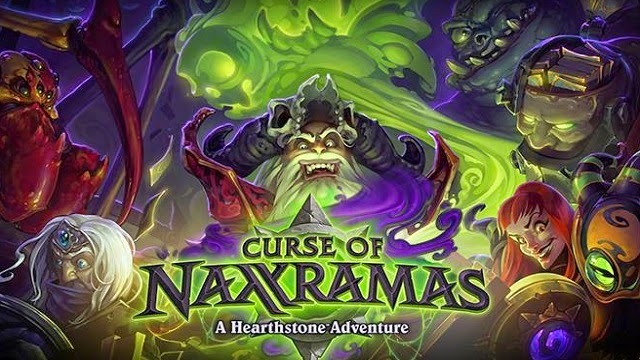 A short while ago an expansion was released in weekly installments for the game and titled "Curse of Naxxramas" or "Naxx" if you have as much trouble as I do remembering how to spell its official name. I wanted to wait for every week of "Naxx" to be released and "out in the wild" for a little bit before I reviewed it. My reasoning was that until every new card (of the approximately 30) was available it would be hard to see how the overall way of playing "Hearthstone" would be impacted. Well, now that the dust has settled and "Naxx" no longer quite has that new-expansion smell, I can say that while the way of playing the game has shifted in some respects, there is nothing absurd and game-breaking. If you don't play "Hearthstone"then my using a term such as "Deathrattle" may confuse you, so in order to keep this review understandable for those who don't play Hearthstone I'll explain in non-Stoner terms (there has to be a better way of putting that) the biggest aspect of this expansion. Basically, when a card has a "Deathrattle" it means it is a "minion" you put on the board, and if you play that card and it is eliminated/killed something useful will happen. This useful action can range from you drawing an extra card to summoning a super-powerful minion. Within this new "Naxx" expansion a bunch of cards have the deathrattle ability, and of the various character classes you can play as there are cards that compliment these deathrattles quite well. 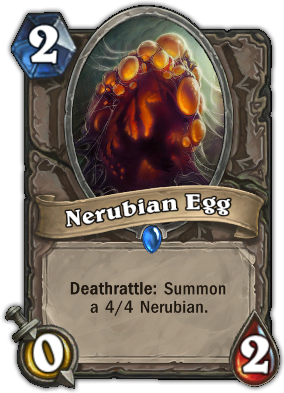 For instance, if you have a card like the "Nerubian Egg" that summons a pretty powerful minion when it is eliminated, and then have a card that lets you destroy it and make a new one (AKA reincarnate, you basically get a free powerful minion. Cards like that are result in "Naxx" being a very deathrattle-heavy expansion, and it has influenced a variety of decks. Another useful ability in "Hearthstone" is playing cards that set up a "secret". These are what their name says, a secret action that only takes place when your opponent takes a certain action. Whether this means you get to survive an attack that would otherwise make you lose the match or that when an opposing minion tries to hurt you or your own minions they end up being put back into your opponent's hand and cost more to re-play, secrets are extremely useful. 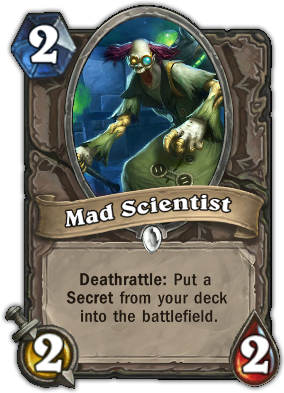 That makes the "Mad Scientist" card one that I've seen be quite popular with people playing as Mages or Hunters--two characters heavy on secrets. A very fun aspect of "Naxx" is that to unlock most of the new cards you have to play matches against computer-controlled characters with unique decks and powers. Instead of being like regular matches, these are sort of like fun puzzles, where to figure out how to win a match you need to build a specialty deck. The matches are never too hard, which is good as many of us players just want to unlock the new cards--there is a "Heroic Mode" where winning is extremely difficult however for those who want a challenge. I feel that 30 cards is an okay amount, but am pleased to hear future expansions will carry more, even if it is at the expense of the puzzle-style matches against the computer. "Curse of Naxxramas" introduces some fun matches to play in and a good helping of new cards. It changes the overall way of playing "Hearthstone" just enough to keep things interesting, but does not alter the game so much it becomes unrecognizable. While "Hearthstone" is a game that is free-to-play because you gain gold (which can buy a lot of stuff) by completing challenges, you can just pay to open every level or "Wing" of "Naxx" if you don't want to work at gaining enough gold, with it costing you about $25 to unlock every "wing". That isn't cheap, but it also is relatively easy to earn gold should you want the cards for truly free. The cards also are of course not mandatory to do well at "Hearthstone" but help expand your options. Overall "Curse of Naxxramas" is fun, even if 30 cards seems a bit light and it can be bit more costly then I would like. Should you already be a fan of "Hearthstone" you'll love it, and if you're thinking of getting into "Hearthstone" these cards will give you even more choices as you start out--should you pony-up the cash early-on for them.